A good recipe is a good recipe no matter from where it hails. I found a recipe in Parade Magazine, you know, the supplement zine/rag you get with the Sunday newspaper? The recipes in it are by noted cookbook authors such as Dorie Greenspan and the late, great, Sheila Lukins (Silver Palate Cookbook fame et al). Over the years I've cooked, taught and blogged about several recipes I've filched from Parade Magazine. I make a killer good potato crusted halibut - utilizing instant mashed potato flakes. My trick to making these recipes work is to use more seasonings and cut back the fat. The Southwest Shepard's Pie is a good recipe. Economical, easy and tasty. I wanted it to be a bit more flavorful and a lot lower-fat. That's my mission - to make healthy meals that taste great without compromising flavor, or adding in faux ingredients or relying on sugar and salt to compensate for the lower-fat content. I took out the butter in the sweet potato mash, switched from whole milk to skim; substituted lean ground turkey for the ground beef. Added corn tortillas to the bottom with a layer of low-fat shredded cheddar; tossed in some extra veggies just 'cause that's what I had on hand. Of course, there are some other tricks one could use to meal-doctor this dish. I could have used my favorite fillers - shredded carrots and pumpkin puree too. The meal could have been an almagamation of Deceptively Delicous Semi/Simply Home-Made goodness. Try it out, and let me know what ideas you incorporate. The original printed recipe states the total cost is less than $8 to make. I had all fresh and nearly organic ingredients - farm share items from the past week. Over-all it is a meal for 4 that's less than $3 per serving, plus you get great left-overs, it freezes well and tastes better the next day! How can you go wrong? The recipe reminds me of so many church-style casseroles, in a good way though. Or my Fall and Winter Favorite - Grecco - the ultimate church casserole meal. 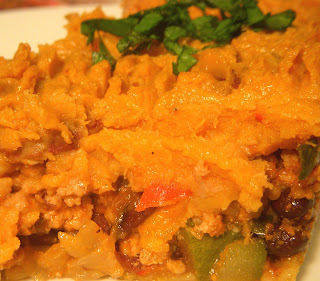 It is also like a dry-style chili topped with mashed sweet potatoes. Once you make it, you wonder why you never thought of this before. I've been doing versions of it for years, it just never came together like it did until now. Place the sweet potatoes in a 3 or 4 quart sauce pot and cover with cold water. Season water with a teaspoon of salt. Cover pot and bring to a boil. Reduce to a simmer and cook the sweet potatoes until they are fork tender. Drain; mash with milk and season to taste with salt and freshly ground black pepper. Set aside, covered and keep warm. In a large non-stick skillet, brown the ground turkey until it is cooked through, about 5 minutes. Season with salt and freshly ground pepper. Drain the turkey if necessary and a put the cooked ground turkey into a bowl or plate and set aside. In the same non-stick skillet, heat the oil over medium-high heat until it shimmers. Add in the onions, peppers and garlic and saute until the onions turn from translucent to golden and the peppers soften and begin to take on some color - about 8 to 10 minutes. Add in the diced zucchini and saute another 4 minutes. Add in the dry Mexican/Taco seasoning and toast to bloom the spice flavor. Stir in the tomato paste. Add in the chopped tomatoes and cook until the tomatoes break down and the liquid they produce reduces. Add the cooked, browned ground turkey back to the skillet, along with the corn and black beans. Simmer for 15 minutes. Season to taste with additional salt and ground pepper if necessary. Stir the mixture to fully incorporate all the vegetables and meat. Use a 9 x 13 baking dish and coat the bottom with cooking spray. Layer the corn tortillas down, over-lapping if necessary on the bottom of the baking dish. Spread a layer of cheese over the tortillas. Next, spoon the vegetable/meat mixture over the tortillas and cheese. Spread the mashed sweet potatoes over the vegetable/meat. Run the tines of a fork over the top of the mashed sweet potatoes to create a criss-cross pattern if desired. Bake in the pre-heated 375 Degree oven until top of sweet potatoes are browned and crispy - 30 to 40 minutes. Serve hot and garnish with cilantro if desired. Serves 4 to 6.